Your online system for solving what’s next. 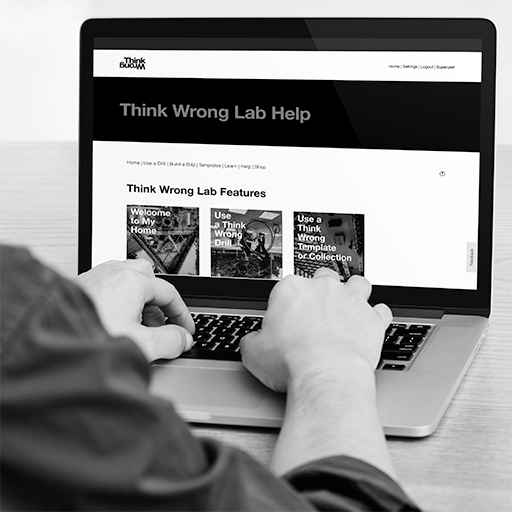 The Think Wrong Lab is an online platform that empowers everyone, anywhere to solve problems faster and better through our flexible, repeatable and easy-to-learn Think Wrong Problem Solving System. Membership in the Lab gives you everything you need to think wrong in your daily work and life. Learn more about the fundamentals of thinking wrong and gain access to our library of over 150 Think Wrong Drills, how-to videos, and expert-designed Blitz templates to help you invent what’s next—today. Introductory offer: $499 a year. Use and share within your team. Full access for everyone across your entire organization—share with partners and clients too. One tool, a million uses. Choose one of our pre-designed Blitz templates or drills from challenge-specific collections and sets. Design and run your own custom Think Wrong Blitz, right from the Lab. Watch Think Wrong Masters explain the fundamentals of thinking wrong. Access Think Wrong Lab help from any screen. Find Think Wrong Supplies, Tools and Printable Posters in one place. Accessible from modern browsers—even on the go. Thinking wrong is problem agnostic, so you can think wrong about anything—and everything. Give us a little information so we can provide you the best fitting membership, including the language, frameworks, tools and techniques you need to think wrong and solve wicked problems—whenever and wherever you are. Grant a membership to your favorite school, non-profit, or foundation.